Online holiday shopping revenue is estimated to hit a massive 124.1 billion dollars this year, a 14.8% more than last year’s spending. That’s more reason for you get excited about the holidays. However, for small businesses with a relatively modest marketing budget, how can you compete with titan businesses with infinite resources? Are there holiday marketing ideas to help you stand out this holiday season and outsmart your competitors without making a huge dent on your financials? get the hassle out of the holiday rush with practical holiday marketing ideas. It’s without a doubt that the holidays is the season of gift giving. Holiday shoppers are expected to spend an average of $638 on gifts for their family, friends, and coworkers. But, we all know it’s hard to shop for the perfect gifts. We spend a considerable amount of time just to find the most suitable gift to give. This is why building your holiday gift guides is one of the must-have holiday marketing ideas for small businesses. It helps your customers speed up the process of finding the most suitable products to give. Plus, they might even stumble on products for themselves. For example, Blue Mercury created several holiday gift guides in three groups: lifestyle, category, and price. 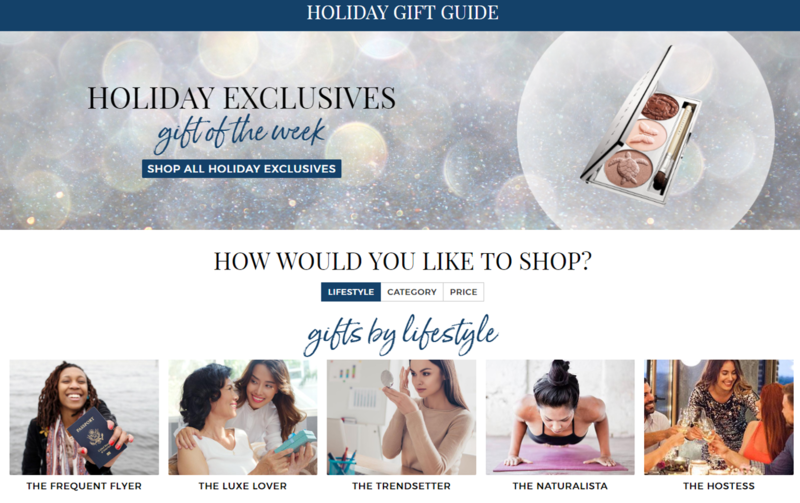 Aside from creating your own holiday gift guides, you can reach out to holiday gift guide curators, such as niche influencers or bloggers, and ask them to include your products in their holiday gift guides. This way you can take advantage of their followers and reach new potential buyers. Most gift guide curators ask small businesses to submit products which they want to get featured on their holiday gift guides. Usually, niche influencers and bloggers don’t require a monetary fee but only ask for product samples in exchange for getting featured. You can easily find Google gift guide curators but we recommend that you start your search on social media. This way you can already gauge their audience size, engagement level, reputation, and brand suitability. 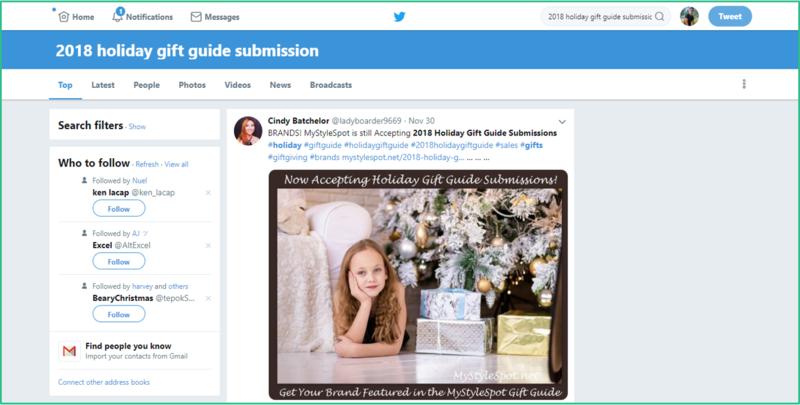 A quick search of “2018 holiday gift guide submission” on Twitter will return you a list of bloggers and influencers who are accepting products to be included on their guides. To narrow down your list of potential curators, use a single file to put all your holiday gift guide curators into one single view. 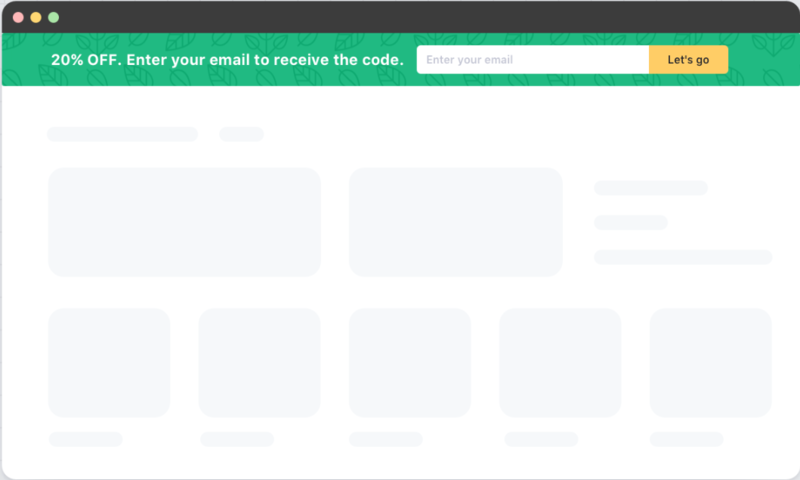 Below is a sample view that you can create. You can download the file here. Whenever the holiday season begins, you will see physical stores decorating their shops with bright Christmas lights and festive holiday ornaments. Your website and social media accounts should also do a holiday makeover to remind your visitors that you are ready for the holiday season. But, you don’t have to do a complete website or social media overhaul as this might confuse and distract people from your brand. Instead, add a few holiday elements to your website and social profiles to convey to your visitors that you are prepared to help them with their holiday purchases. During the holiday season, you can let your hair down and get a little more creative. One of the great holiday marketing ideas is to transform your logo with a festive update, like incorporating holiday icons like Christmas stockings, Santa’s hat, etc. For example, Urban Outfitters updated their website’s logo into an animated GIF to incorporate a Christmas ribbon. Your website’s headline is the most visible area of your site, so take a chance to display your holiday promotions here by utilizing header bars. The use of header bars is an effective way to briefly summarize your objective and convince people to take the desired action. Header bars stay afloat or stick at the top your website’s page so they won’t interfere with your site’s main content and disrupt the visitor’s shopping experience. For example, Sally Beauty used a header bar to promote their “12 Days of Christmas” campaign which offers new discounts every day in a span of 12 days. You can steal this holiday marketing idea by using the Smart Bar feature from SiteKit to announce your holiday promotional campaigns and easily grab your visitors’ attention. Because the holiday season is about gift giving, allow your shoppers to share their holiday wish lists to their family and friends. This way, shopping for holiday gifts for family and friends will become a lot quicker and simpler when wishlist functions are offered to your customers. You can enable adding and sharing wishlists so your customers can simply browse products or services on your website, add items to their wishlist account, and then post a link of their wish lists straight on their social media accounts or via email so that their loved ones will immediately know what gifts they want to receive for the holidays. A perfect example is UncommonGoods’ wish list feature which can be shared by shoppers via a link so that their friends and family can easily access them online. 6 in 10 would like to receive a gift card, making gift cards the top holiday gift. With this, one of the holiday marketing ideas to implement is to offer both physical and digital (e-gift) cards so that shoppers can easily gift them to their loved ones. By offering holiday gift cards, you are making the sale faster because gift givers won’t have to take the time on deciding which products to give. You’re also empowering the receivers to choose the products they actually want, thus, decreasing the probability of returned merchandises. Gift cards are a great way to get cash upfront because you won’t have to wait to make a sale. Whenever a gift card is bought, that cash is yours until the gift card is redeemed by the recipient. Plus, it helps your brand reach a new audience. Sephora offers a physical holiday gift card with various denominations. The gift card is designed with a holiday theme to entice shoppers to buy. The holiday season is a time when many people are eager to give good tidings to those in need and make donations to charitable institutions. In fact, 36% of holiday shoppers plan to give back by donating money to a charity or cause. As small businesses, you can take advantage of the charitable spirit of your shoppers by offering them the option to give back a portion of their purchase to a charity. For instance, you can say that a percentage of your holiday revenue will be donated to a charity close to your heart. This way, you’ll get customers to purchase your products while helping the less fortunate. Annually, Macy’s partners with Make-A-Wish foundation to create life-changing wishes. For every letter that Macy’s received, it would donate $1 to the Make-A-Wish foundation to grant the wishes of children with critical illnesses. During the holidays, an increased traffic means a potentially high cart abandonment. People are busy searching for the perfect products so they are most likely to compare prices and products before making a purchase. They can also get distracted by a lot of things during the busiest shopping season. This is why in order to capture these abandoning customers, you need to employ a tool, such as retargeting, which will help you automatically re-engage with them. Retargeting is an algorithm-based tool which targets your abandoning shoppers by displaying relevant ads outside your website. For example, Facebook has a retargeting service called Dynamic Product Ads which allows you to re-engage with people who navigated away without completing their purchase. What it does is when they log back to Facebook, they will be displayed with ads of their abandoned products. The increased holiday traffic means new customers. However, new customers don’t guarantee a successful purchase. So instead of focusing all your holiday marketing ideas and efforts on new customers, why not reach out to your previous holiday shoppers? The holidays present a perfect timing and mood to reignite your relationship with your old customers and get them back your site for some holiday purchases. Plus, it’s actually much easier to sell to customers who have previous experience from you compared to new ones. Email a thank you note together with the product they bought last year and then remind them that you are ready to help with their holiday shopping once again. Offer your holiday promotions and complementary products that they might be interested in based on the items they purchased last year. Request for a feedback regarding their past holiday experience with you and reward them with a special holiday promo. Traditionally, physical stores provide free gift wrapping services to their customers during the holidays. This might be a seemingly native and simple add-on service but it is already a valuable gesture that you can bestow to your shoppers. Holiday shoppers also take gift wrapping options to take the hassle of doing the wrapping themselves. So, make sure to implement this holiday marketing idea and give your customers the pampering of a perfect holiday gift giving spirit! Holiday gifts are supposed to be personal and so a lot of senders put effort into writing holiday greetings or messages that come along with their gifts. add a printed holiday card to be included in the gift delivery (you can charge this one). 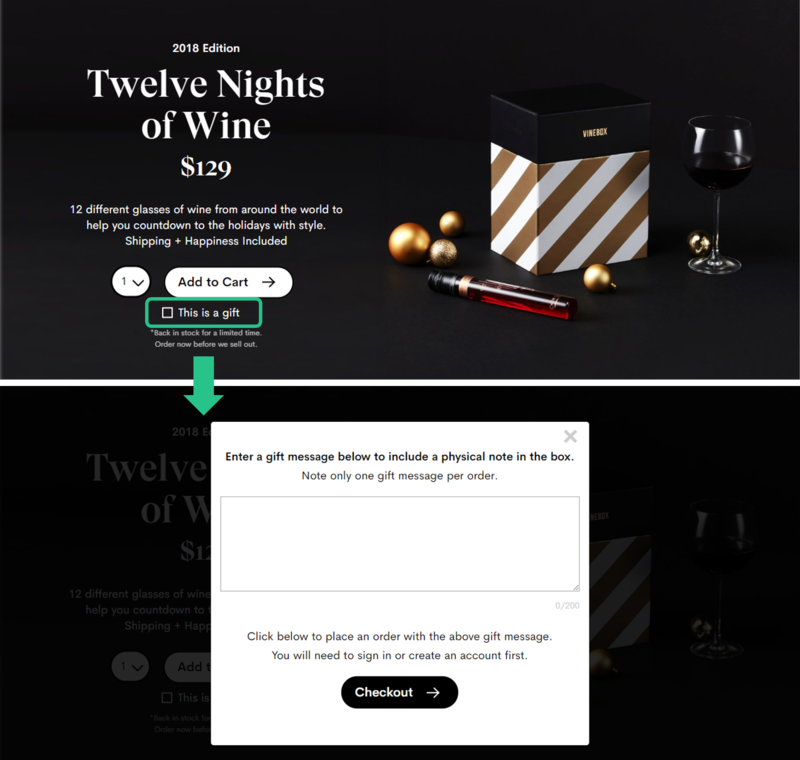 For example, Vine Box has included the “This is a gift” feature which allows shoppers to add a gift greeting to be included as a physical note in the delivery box. Have you noticed that Christmas baskets are everywhere during the holiday season? The reason behind this is most shoppers are looking for great deals and discounts during the holidays to maximize their budget. Plus, when shoppers find items to give as gifts, they prefer products that they find more valuable. So, why not offer holiday bundles to help your shoppers save? Product bundling is when you put together individual items that can be sold individually into a single product. Buying a bundled product at a discounted price is perceived to have more value than purchasing the products separately. When you motivate your shoppers to buy more items in a single transaction, then your average order value will also correspondingly increase. You already lend a hand to your customers, you also maximize your profit. For example, WalterMart offers a do-it-yourself Christmas basket. It entices customers to increase their spending to get a free Christmas basket. Contests are fun but a cost-effective way to increase your engagement. This is especially true during the holiday season because the holidays reminds people of fun, excitement, and celebration. The best way to run your contests is through social media. Most social media users are most likely to be motivated to visit a social media site when they know they can win or get something in return. In fact, brands see a 66% increase in contest submissions on Facebook during the holidays. What you can do is to incorporate holiday elements to your contest. A holiday-themed contest will get your followers excited for the holidays and attract new audience and engagement to your social media sites. To make it work, offer a contest prize that is relevant and enticing to your target market. Plus, be sure to set simple mechanics and enough duration to let it grow. 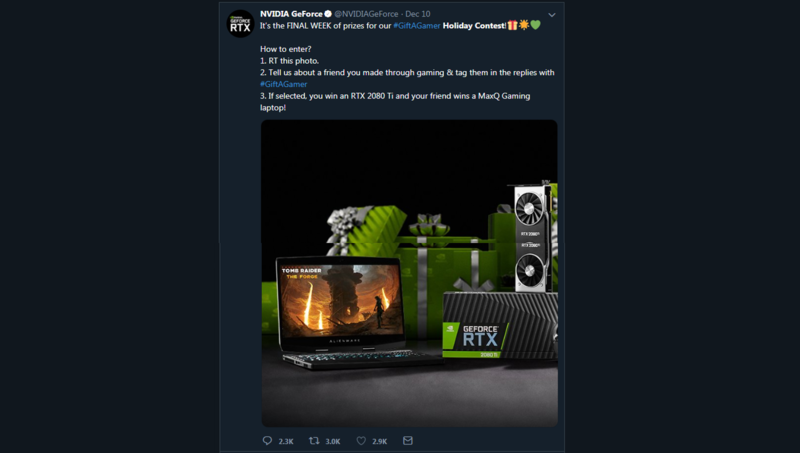 NVIDIA already garnered more than 3,000 retweets and almost 3000 likes on Twitter with its holiday contest. It’s effective because, in order to join the contest, participants must tag one of their friends first. Plus, both the participant and the tagged friend will get the chance to win. Let’s all admit it, there will be holiday shoppers who will procrastinate and do their shopping at the last minute. In fact, there’s still 53% of holiday shoppers will just buy their holiday needs on the last Saturday before Christmas and 5% of them will make holiday purchases after Christmas. Now, you need to make sure that you have holiday marketing ideas to target these procrastinators. Make sure that you offer last-minute holiday deals to incentivize your shoppers to buy from your store. If you have surplus holiday inventories and want to dispose of them before the upcoming year, you can also set up a last-minute holiday sale of your unsold holiday items. 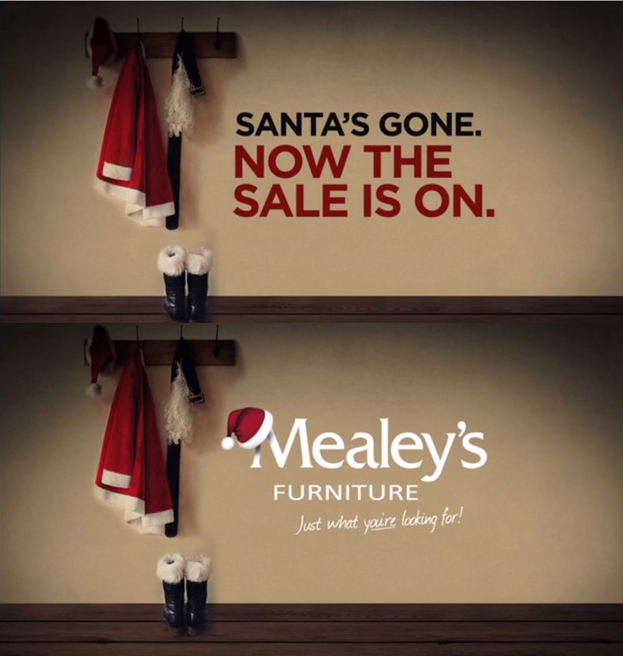 Mealey’s targeted procrastinating holiday shoppers with its “Santa’s Gone” campaign which offers post-Christmas sale. The holiday season is without a doubt a profitable time for small businesses. However, this also means a more cutthroat competition. With our proven holiday marketing ideas, you can gear up your small business and get ready to win and be merry this holiday season.